Sportsday - How would you sell Aston Villa? Play video How bad is Remi Garde really? from BBC SportHow bad is Remi Garde really? Newcastle goalkeeper Elliot out for "number of months"
That's it from Sportsday, we'll be back from 08:00 BST tomorrow. In the meantime, you can follow England's progress in Delhi here as they attempt to chase down New Zealand in the World Twenty20. Gary Neville had a 35.7 win percentage at Valencia, but that drops to 18.8 percent in La Liga. The former Manchester United defender was in charge for 16 league games, winning three and losing eight. Neville, 41, was in charge for less than four months, winning 10 of the 28 games Valencia played in all competitions and losing 11. 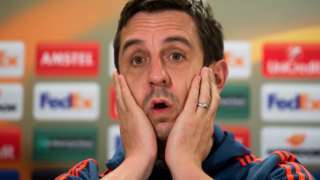 Gary Neville is sacked by Valencia after less than four months as head coach. German newspaper Bild are reporting that Tottenham are considering a £24m move for 20-year-old Borussia Moenchengladbach midfielder Mo Dahoud. Arsenal close to £35.4m Xhaka move? German newspaper Bild are reporting that Arsenal are edging closer to agreeing a £35.4m summer deal for Borussia Monchengladbach's Swiss midfielder Granit Xhaka. The Oxford Mail are reporting that the League Two club have sold almost all of their 33,000 allocation of tickets for the Johnstone's Paint Trophy final against Barnsley at Wembley on Sunday. 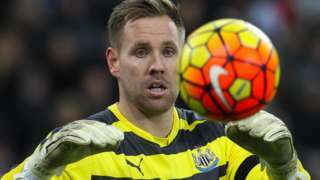 Republic of Ireland goalkeeper Rob Elliot says he will miss Euro 2016 after being ruled out for a "number of months". 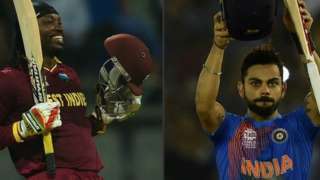 West Indies captain Darren Sammy says his side will be David to India's Goliath during their semi-final clash. 40-team World Cup by 2026? The Mirror are reporting that Fifa are keen to increase the World Cup finals to include 40 teams by 2026. Speaking during a visit to Uruguay, new president Gianni Infantino said a larger competition would mean an extra place for South America. "We must open [the finals] up to more. The idea would be from 2026," Infantino said. "We're going to talk about this with everyone: players, the [Fifa] council." One of Lurgan Celtic's outfield players is set to don the gloves for their Irish Cup semi-final on Saturday. Regular number one Conor McCorry is suspended after being sent off last weekend while back-up keeper Jamie McAtavey has a broken wrist. Outfield players Raymond Fitzpatrick or Dale Malone could play in goal against Linfield. 2012: Aston Villa captain Stiliyan Petrov announced he had been diagnosed with acute leukaemia. Vicarage Road to the Bernabeu? According to the Daily Mirror,Real Madrid are considering a move for Watford's Miguel Layun to provide competition for Marcelo at left-back. The Independent are reporting that the Dutch Football Association want embattled Manchester United manager Louis van Gaal to become the technical director of the national team. Who says footballers are only interested in themselves? Arsenal's Chilean forward Alexis Sanchez has funded the construction on two artificial football pitches in his home town of Tocopilla. "I built them because I wanted young kids to have a decent pitch to play on, because I didn't have one when I was younger,” he told the club website. Catalans Dragons skipper Remi Casty will be out of action for four weeks after fracturing a rib cartilage in their Easter Monday win over Castleford. The 31-year-old prop has played five games in 2016 after having last season cut short by a knee injury. The Liverpool Echo is reporting that Jurgen Klopp is considering resting playmaker Philippe Coutinho for Saturday's meeting with Tottenham. The 23-year-old was an unused substitute in Brazil's 2-2 draw with Paraguay on Tuesday but will not report back until tomorrow following a 13-hour flight back to England. Such has been the impact made by Marcus Rashford in his short senior career that team-mate Marcos Rojo says he is already one of Manchester United's key players. "Rashford is a great young player with an important future ahead of him and I hope he keeps playing like that because it helps us a lot in each match," said Rojo of the striker, who has scored five goals in eight games for United. Tottenham are interested in FSV Mainz attacking midfielder Yunus Malli, according to the Daily Mail. Spurs are already identifying targets for the summer transfer window and the 24-year-old features prominently on Mauricio Pochettino’s shopping list. The White Hart Lane club enquired about the Turkey international during the winter transfer window but a deal couldn’t be concluded. Two key wickets for England. Colin Munro had been belting it, but has just been caught by Moeen Ali off Liam Plunkett. This after Moeen had caught and bowled Kane Williamson. New Zealand are 107-3 after 13.2 overs and you can follow the game here.